»Action Needed»Please Email Senators by Feb 20 ~ WA Proposed Lyme Bill S.B. 5448 Updates ~ Action Needed! Please write Washington state Senators immediately to show your support! This post forwards the requests of Washington Lyme activists and organizers (with clear and specific steps to take), including the Lyme Disease Seattle WA Support Group, Ticked Off On Lyme WA, and Dan Boeholt (Bill coauthor). Residents: The links below make it extremely fast and easy to find and message your Senator, whether you know who yours is or not. Your zip code will quickly take you to the right place. Have a 1,000 character message in mind and you are good to go! Non-residents: There are multiple places on the page that will take you to names of senators or options for messaging. Although the submission form asks you to verify your district, this will not keep you from being able to send your message. It may tell you that you are in a different district, and ask if you would like to be re-directed, but it will also give you the option of sending the message anyway. Also, email addresses can be found on home pages, which takes more navigation. All Readers: The submission form is limited to 1,000 characters, so you may want to draft this and have it ready. The goal now is to contact Senators. House Representatives will be better to contact later, when the Bill reaches the House (check for updates on the facebook page linked above). Following the request/challenge below are additional links and additional updates from Dan as posted on Ticked Off On Lyme WA. I grew up in Washington state and although the tick bite that gave me Lyme and coinfections was in Montana, most of my tick bites occurred in Washington, mostly during my time as a Wildland Firefighter, and I still visit and recreate frequently. I also have many family and friends in Washington and would like to hope that appropriate care would be available to them if needed. My letter so far is also included at the end of this post, which I plan to adapt for emails and short comments as needed. 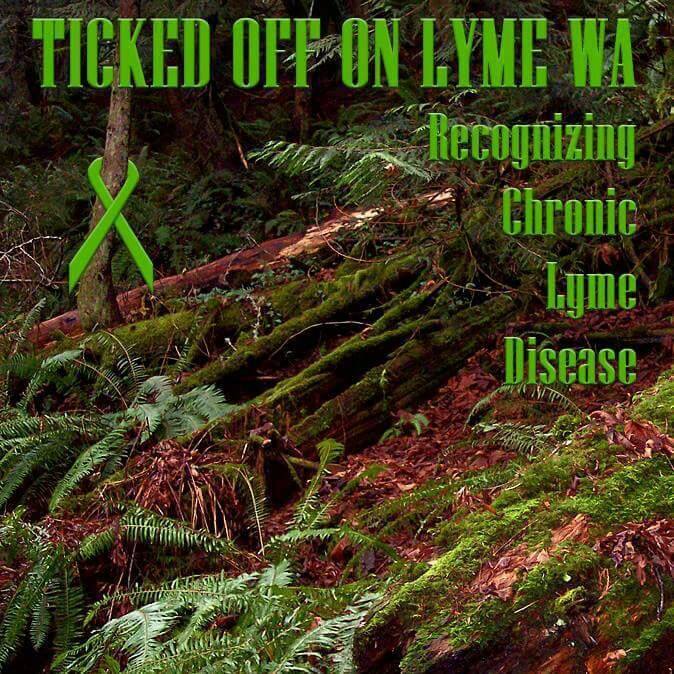 Continue to watch for updates at Ticked Off On Lyme WA’s facebook page. It’s time to make this personal. I want to see everyone write to WA Senators and show your support! If you visit WA on vacation let them know you want all visitors to be safe too. #1. To submit comments to the committee on Bill 5448 this was the original link that we asked you to comment on and share a few weeks ago. #3. Next go back to the senator link and click on their homepage. Here you will have an option to email them. Keep it to a page explain why this bill is important to you, they have limited time and can’t read a book! If you can get to a meeting with them request a meeting in the subject line of your email asking to discuss the importance of this bill. #4. If you can go to a meeting with your senator, request an appointment as described in step 3. If you get a meeting it will be for 15 minutes max so be prepared to present yourself quickly and efficiently. People can accompany you that aren’t in your district but it would be great to have 2 people from the same district. If you would rather not go alone ask a friend or family member to attend with you or ask someone from our group to attend with you. We spend more time watching our favorite TV show or surfing the web than the time it will take to submit comments and write a page long letter! EACH AND EVERY ONE OF US needs to contact the committee and our senator and ask for their support on Bill # 5448 Recognizing Chronic Lyme Disease and Protecting the Doctors that treat it! You can submit the same paragraph comment to both on the bill pages. Think this will happen without you? Think again! Ask your friends and family to submit a letter/email. We need to rally every voice so that we are heard! YOUR MEETINGS, YOUR LETTERS/EMAILS TO YOUR SENATOR CAN AND WILL MAKE A DIFFERENCE. It’s hard to ignore tons of personal stories and not so hard if they never know our stories. LET US STAND UP AND BE HEARD! If they don’t hear from any of us we are INVISIBLE. We need to rally: every single one of us needs to contact committee and our Senator (don’t worry about contacting your reps right now that will be our March Challenge! Upcoming Lunch Meeting end of February for next steps on supporting this important bill, contact for details! Please join us for the next steps in supporting Bill #5448 Recognizing Chronic Lyme Disease and Protecting the Doctors That Treat It. Every voice is needed! “Houston we have a problem” ~ Our Lyme Bill SB 5448 Passes out of Senate Health Committee as Amended ~ Calls for a study on long term use of Antibiotics and their effects on Lyme Disease with a Report to the Governors office and Legislature by Dec. 1, 2015. – Moves then to the Senate Floor for Debate and Vote and Needs to Pass by 1st week in March ~ All indications are Very Good !! – Moves to the House Health Care Committee for Public Hearing in March ~ Things looking Good here too, Need Supporters there! – Needs to pass out of Committee in March to make it to the House Floor for Debate and Passing by April or End of Session. I am a former Washington/district resident and professional federal biologist who contracted Lyme disease through a tick bite in the course of my fieldwork in Montana in 2010. Despite several acute symptoms and the onset of Bell’s palsy within weeks of the tick bite, I was misdiagnosed for three years. This delay in treatment meant that several months of antibiotics, combined with other therapies, were needed to begin meaningful recovery. Length of infection increases the complexity and length of effective treatment. I am a former Washington resident and professional federal biologist who contracted Lyme disease through a tick bite in the course of my fieldwork in Montana in 2010. Despite several acute symptoms and the onset of Bell’s palsy within weeks of the tick bite, I was misdiagnosed for three years. This delay in treatment meant that several months of antibiotics, combined with other therapies, were needed to begin meaningful recovery. Length of infection increases the complexity and length of effective treatment. Not all patients recall being bitten or by which vector species. These factors contribute to prolonged diagnosis time-frames, increase duration of illness, and reduce the effectiveness of short term antibiotics (which may have been effective during acute infection). You can help current and future patients regain their health more effectively, with lesser costs to families and communities, by supporting this legislation. My extended family still resides in Washington as do dozens of other friends and loved ones, almost all of whom recreate in the outdoors avidly. Please consider this information for residents and patients. They should not lose their lives to arbitrary limitations.